Whiteness is No Longer The Default in Hollywood - Select. When Black faces are at the forefront in Hollywood, this disclaimer is rolled out like a red carpet to welcome viewers of all colors and backgrounds to fill theater seats. On one hand, it’s business: The color Hollywood is most enamored with is green, and a film’s financial success lies heavily on box office pull. On the other, it’s a measure of our humanity—or lack thereof. Can white viewers truly enjoy and relate to a story told by and with Black people? Unless they are offered a disclaimer, it seems like the answer is an absurd no. 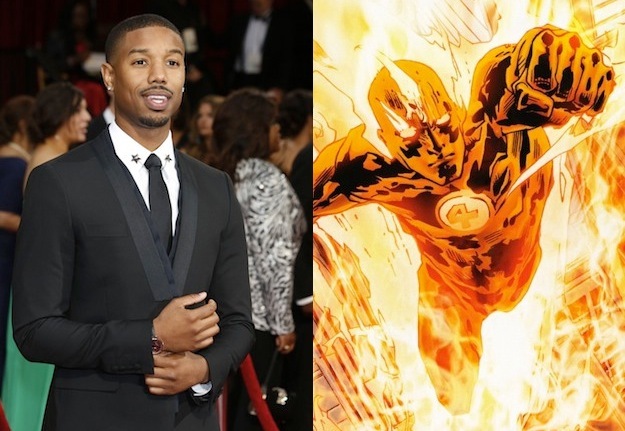 Michael B. Jordan’s casting as the titular character in The Human Torch (originally depicted in comic books as a White man) has unleashed the latest firestorm of discussions around race and casting. Additionally, Tilda Swinton is in talks to play the Ancient One (originally depicted as an Asian man) in Marvel’s upcoming Doctor Strange film. Online commentary for Jordan’s casting have invoked racial slurs as a means to express outrage that a beloved and relatable character has been changed so “drastically.” Online commentary for Swinton’s possible casting leans towards overwhelming defense and celebration of her thespian skills—despite the fact that Tilda Swinton is a white woman, not an Asian man. No one seems particularly worried about not being able to connect with Swinton as the Ancient One, but many white commenters seem to struggle with the concept of seeing a superhero portrayed on screen by someone who clearly does not look like them. Why is the “not just a Black film” card played so frequently? Why must Jordan defend his casting, while white actors are slotted into roles originally intended for people of color without much fuss? Why do Black roles and stories require such an over-explanation to convince white viewers that they belong in the audience? The answer is a flimsy excuse: The myth that white people are unable to connect with and relate to people of color on screen. This disconnect is predicated on a history of Whiteness as the default for humanity—a history that is still upheld in Hollywood today. White people are able to see themselves as lovers, heroes/heroines, plucky underdogs, apocalyptic survivors, and everything in between. They’re able to see these representations, and the possibilities of them, on screen and in their real lives. The image of Whiteness is undeniably human. However, Blackness is not viewed in the same way. Narrow, stereotypical ideas of Black people in society coupled with the same narrow—or otherwise nearly nonexistent—representations of us on screen reinforce the idea of Blackness as other. Breaking through this disconnect requires the ability to see Black people in love, in coming-of-age stories, as part of history, and as victors and heroes. Black people must be seen as beings who think and feel and love and cry and win and lose and live and die like everyone else. One would like to believe that White audiences have the ability to recognize the tapestry of today's society includes Black and other people of color. Thus, mainstream cinema should reflect that. It would be more than wise to think that white audiences can relate to Black actors, characters, and stories without having to equate them as “the Black version” of something white. And surely, white audiences can accept their inherent privilege allows them to take up space in a multitude of areas. A Black Human Torch won’t subtract anything from their lived experience, but it does add enormous value for those of us who want to see ourselves as superheroes too, and who want to see art mimic the world that we live in today. If these assumptions are a stretch, then the onus is on white people to do the necessary work to make them valid. Black people do not and should not have to prove their humanity, on screen or off. Bee Quammie is a Toronto-based healthcare professional, writer, and founder of ‘83 To Infinity and The Brown Suga Mama. Recognized by Black Enterprise & the Black Canadians Awards for her digital work, Bee aims to live '83 To Infinity's motto: "It's never too late to learn something new, do something new, or be someone new." Follow her on Twitter at @BeeSince83.